A moss-like plant not related to mosses at all. Spanish Moss grows on trees in America, with no roots at all. 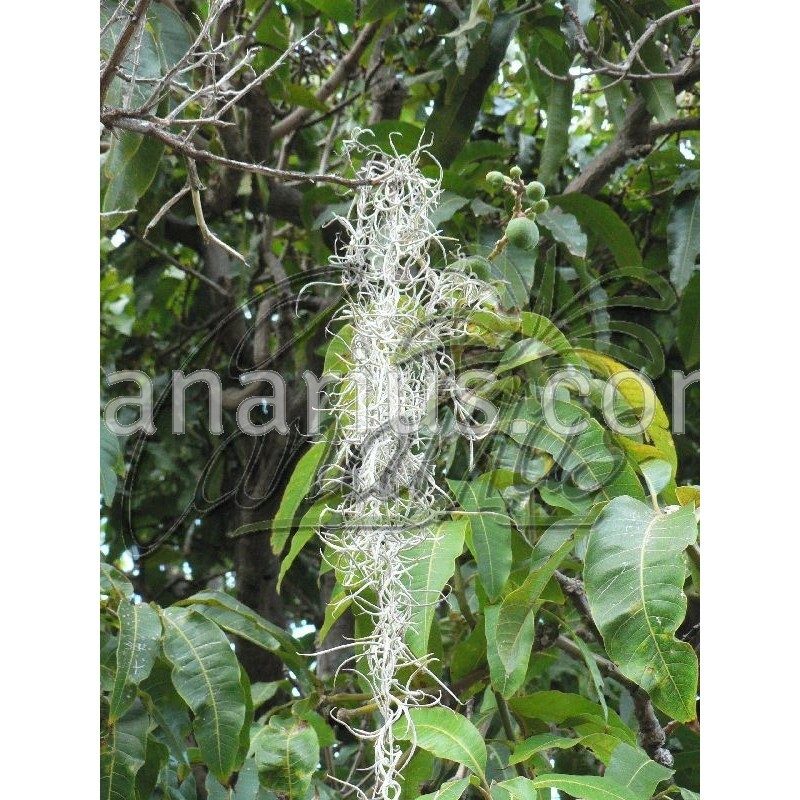 It is Gray when dry and light green when wet, it hangs from tree branches and grows easily. 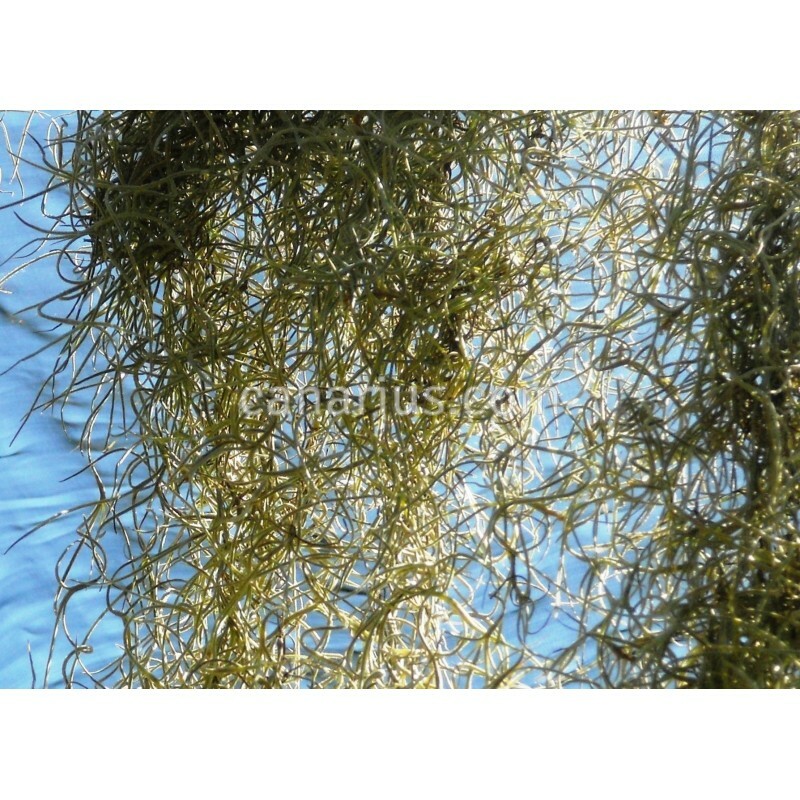 This "Air Plant" can take short freezes to about -6 C.
Spanish moss is not related to mosses at all, but is in fact closely related to the pineapple and other bromeliads or "air plants." It is gray when dry and light green when wet and it hangs from tree branches in wind blown festoons that may reach 6 m (20 ft) or more in length. The stems and leaves are slender and curly, and covered with tiny silvery-gray scales that catch water and nutrients (in dust particles) from the air. Spanish moss has no roots. The flowers are inconspicuous, pale green or blue, and fragrant at night. It is not a parasite, however, occasionally, can become so thick that it shades the leaves of its host, or, when heavy with rainwater, breaks a branch. Although a tree might be weakened, it would not likely be killed by Spanish moss. It is an easy plant. Hang it on the right place and it will start growing! 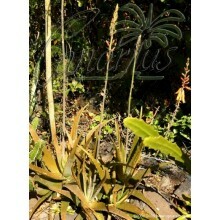 Tillandsia usneoides loves humid and sunny conditions, like soak-and-dry, rain-and-sun. It dies in wet shady conditions. 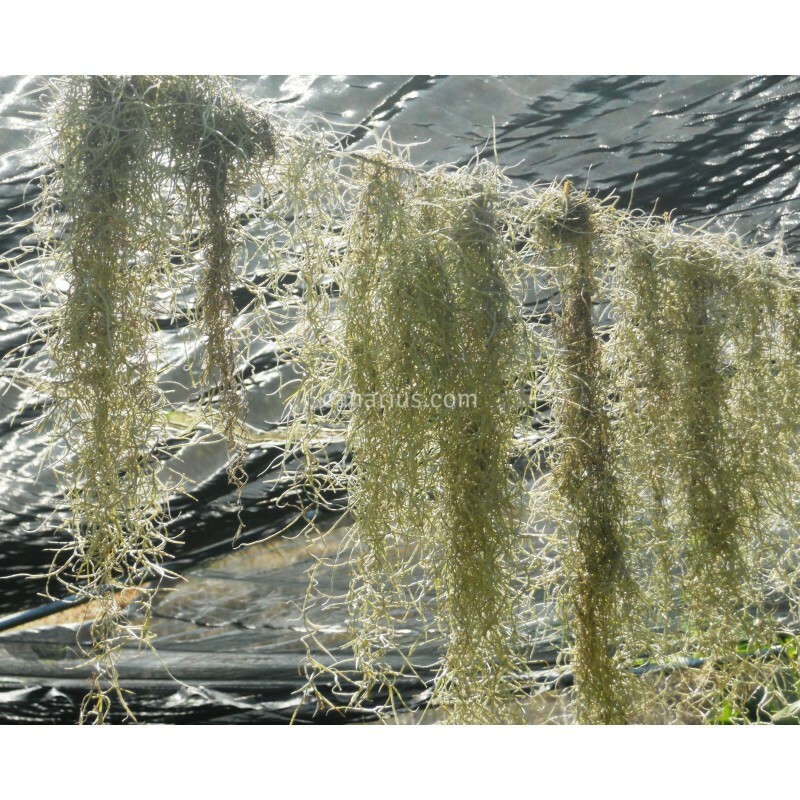 It grows outdoors in Mediterranean to Tropical conditions and it is able to stand short frosts, to - 2 to -7 C.
Spanish Moss is not a good house plant but it can be kept indoors for a few months, for example during winter. People in Europe keep it indoors in winter and then put it out in Spring. It can be hung on anything like wires, lamps, balconies, it can be used in the garden to add a tropical touch. It is often put on tree branches by paths so people can touch it and feel the velvety texture. These branches must receive some direct sunlight, they won't grow in the dense shade under a leafy tree! 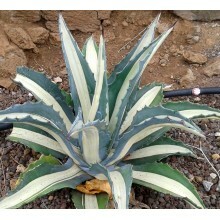 It is a nice ornamental, used to enhance tropical gardens or as an unusual conversation piece. 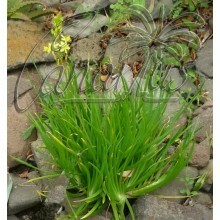 In its native counties Tillandsia usneoides has a multitude of uses as a cheap, light and bulky isolating material. It is even used as packing material or to make mulch in the garden. 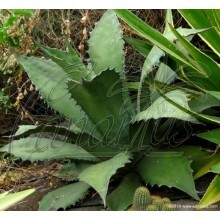 It is often used in decorative floral arrangements and handicrafts.